Blue-Crowned Conure Personality, Food & Care – Pet Birds by Lafeber Co. The blue-crowned conure has a large vocabulary and high intelligence to match. This species is known as one of the better talkers in the conure family, though it can be a little difficult to understand. With its intelligent eyes and iridescent feathers, the blue-crowned conure is not only a favorite among bird fanciers, but it also gained notoriety in the 1998 movie “Paulie,” which featured a blue-crowned conure with a large vocabulary and high intelligence to match. The love-stuck, sensitive conure in the movie had the voice of NBC’s Last Comic Standing’s Jay Mohr and was actually played by 14 different conures. The typical blue-crowned isn’t going to speak even a fraction as well as that Hollywood parrot, but the species is known as one of the better talkers in the conure family, though it can be a little difficult to understand. The blue-crowned conure is a native of South America, and its range extends from Colombia to Argentina. Its natural habitat includes savannas, woodlands, and rainforests. The blue crown is between 15 and 16 inches in length from its head to its long, pointy tail. In the wild, blue crowns are known to flock with mitred conures and cause damage to grain and fruit crops. This parrot’s light forest and woodland habitat is being systematically destroyed year after year, but it is healthy in aviculture and easy to find, largely due to the movie “Paulie.” Because of this, it’s very reasonable in price. This is not a bird that will be content to be locked away in a cage and left to play by itself. A blue-crowned conure prefers company, either a human or another bird. This species can cohabitate with other Aratinga conure species and get along well, but two different species should never be allowed to breed with each another. It matures at 2 to 3 years of age, and may want to breed at that time. If the bird is an “only child,” then the owners should understand that it needs as much hands-on attention possible. Because most people cannot be with their parrot as much as the parrot would like, toys are absolutely essential for the bird’s emotional health. Toys also offer some activity and exercise. The best toys for a voracious chewer like the blue-crowned conure are made from soft wood. Chewing also helps the bird to keep its beak trim. Puzzle toys and toys with chewable grass and willow mats add some additional interactivity. Though the blue-crowned conure isn’t the most colorful parrot and might not catch your attention as easily as some of the other Aratinga species, its personality, talking ability (and movie fame!) are a big draw, ranking it among conure royalty. A blue-crowned conure should be fed a nutritionally balanced manufactured diet, supplemented with fresh vegetables, fruit and healthy table foods. 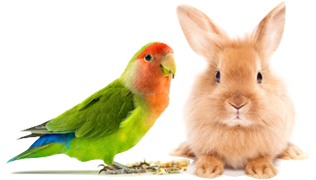 Conures have busy beaks, which makes Lafeber foods a conure favorite. Lafeber’s Avi-Cakes, Pellet-Berries and Nutri-Berries offer balanced nutrition that appeals to a conure’s chewing needs. A properly cared for conure can live between 20 to 30 years. The word “Aratinga” comes from the word “Ara,” the classification of the family of macaws, and “tinga,” meaning smaller, so the Aratinga conures were actually named “little macaws.” The blue-crowned fits this description well in stature, it indeed looks like a little macaw. It’s not the flashiest bird in the Aratinga group of conures, often passed over by those impressed with the sun conure, the jenday, and even the nanday. But the blue crown isn’t a bird to be ignored. It is one of the most amicable birds in the conure family when hand-fed and well socialized. This primarily green parrot is named for its turquoise blue crown and face. Though it is considered more “drab” than some of its cousins, its colors come alive in natural light, showing various shades of iridescent green. Its eye is surrounded by a white, fleshy periophtalmic ring. Its beak consists of two colors – the black lower mandible and the horn-colored upper mandible. The beak is formidable, and though this bird is fairly laid-back, it can definitely pack a wallop of a bite. The species is monomorphic, so there is no visual distinction between the genders. For companion quality, it doesn’t really matter anyway. This is not the cuddliest of conures, but it is an affectionate bird and likes a lot of hands-on attention. It is known to live for 25 to 30 years or more if cared for properly. Like its other conure cousins, the blue-crowned conure can be loud and vocally persistent, and is best for someone who doesn’t mind the raucous call. The person who decides to live with a blue-crowned conure should consider the proximity of their neighbors. Although conures tend to not talk as much as other parrot species, the blue-crowned conure has a reputation for being one of the more talkative conure species. Conures, including blue-crowned conures can be prone to feather picking. If a complete medical exam rules out medical causes of feather plucking, boredom and/or lack of appropriate mental stimulation can be a cause. Offer your blue-crowned conure an enriched environment with plenty of opportunities for play and foraging, as well as a staple supply of safe items to chew. Conures are also susceptible to Proventricular Dilatation Disease (PDD), Psittacine Beak and Feather Disease, Psittacosis, beak malocclusion and Aspergillosis. Regular health checkups by an avian veterinarian are crucial to your conure’s health, as they can help diagnose and treat many disease processes early on. Blue-crowned conures are available for sale in large pet stores, as well as from avian specialty stores and through bird breeders. They are also sometimes available for adoption from avian rescue and adoption organizations. A hand-raised, people-socialized conure can make a good family pet.